This post may contain affiliate links. Read my full disclosure. 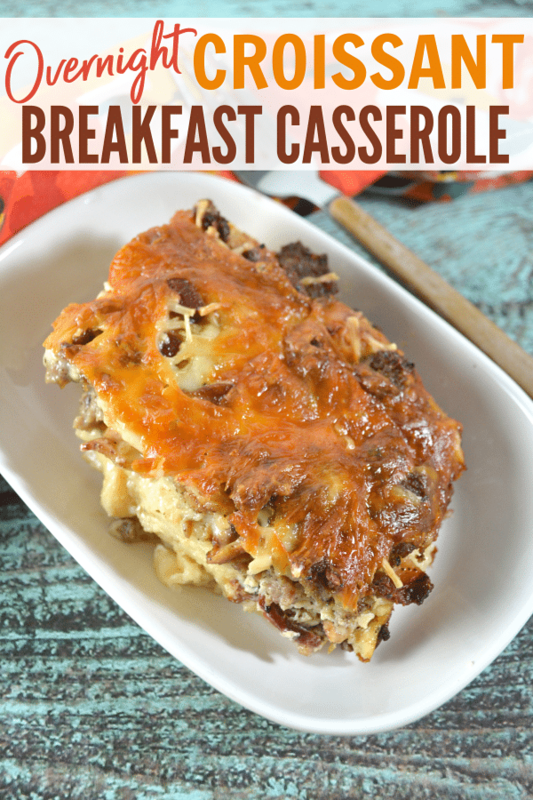 This Overnight Croissant Breakfast Casserole is always a hit! You just prep it the night before and pop it in the oven in the morning. 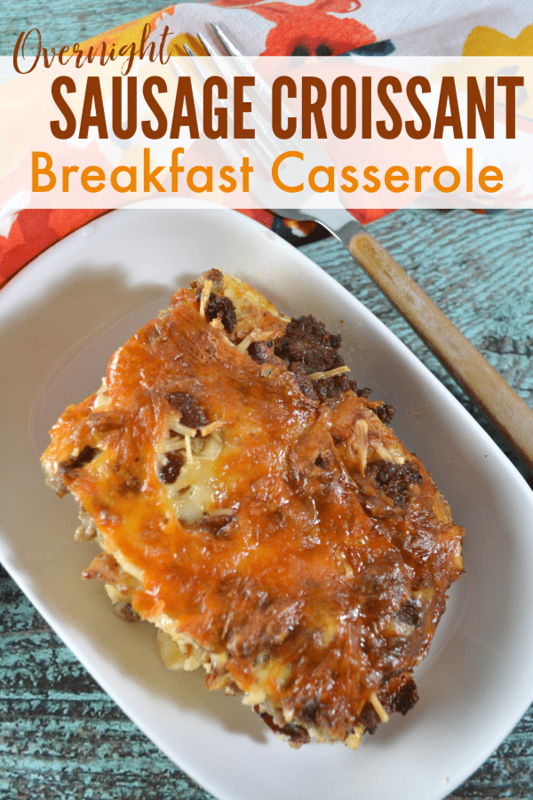 Your family or guests will wake up to the mouthwatering aroma of this hearty breakfast dish. This Overnight Croissant Breakfast Casserole is a combination of all the things my family loves. My husband loves sausage, my sons love bacon, my oldest daughter loves croissants, and my youngest daughter is a cheese fanatic. I love meals my family will eat joyfully and if I can make it in advance, that’s an added bonus. I can prep this dish before bed, put it in the oven in the morning when I wake up. Then, while we get ready, the oven does the rest of the work and a hearty breakfast is ready for us before we move on with the rest of our day! First, you’ll need to cook up a pound of crispy bacon. You can do this on a griddle or in a skillet over medium-low heat. You can also bake your bacon in the oven (400 degrees for 18-20 minutes). After the bacon has cooled, crumble it into small bits. 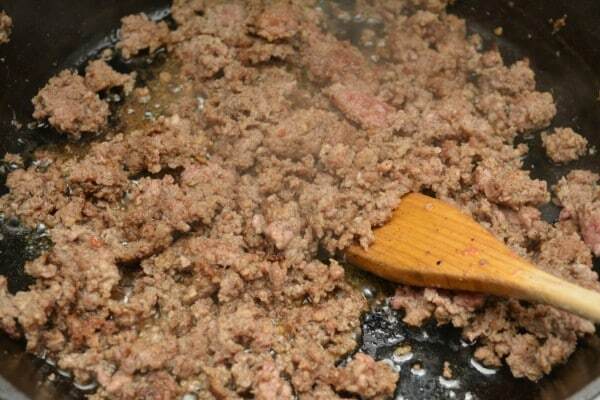 Next, you’ll brown a pound of pork breakfast sausage in a skillet over medium-high heat. 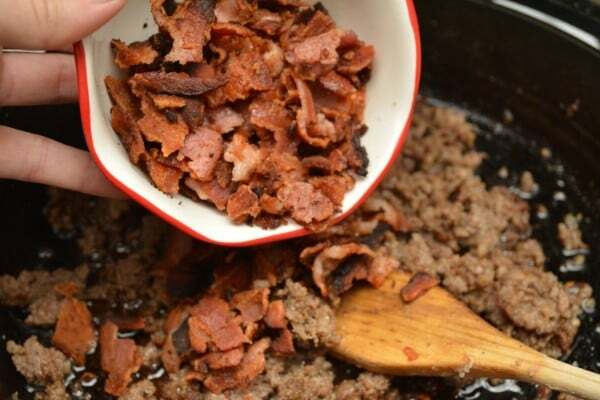 Drain the fat from the skillet and add the crumbled bacon. For the croissants, I like to buy the day-old ones from the bakery. They don’t have to be fresh since they’ll soak up the other ingredients so this is an easy way to save money. 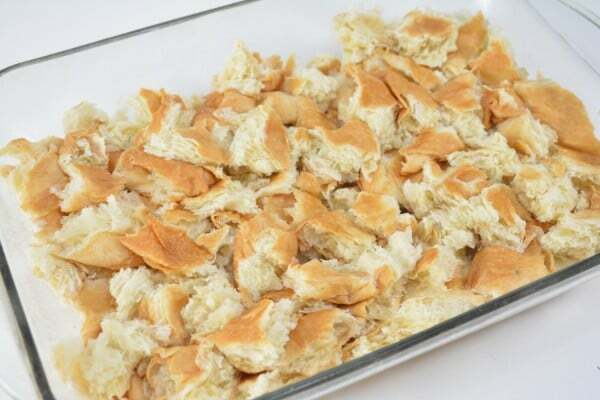 Next, break the croissants into small pieces and press them into the bottom of a greased 9×13 baking dish. Sprinkle the meat mixture over the croissants. Now it’s time to combine all of our wet ingredients — eggs, milk, and cream. We’ll also mix in some seasoning. I use salt, pepper, sage, ground mustard, and garlic powder. Whisk together until well combined. Then, pour over the croissant and meat. That’s it for now! Cover the dish with foil and put it in the refrigerator overnight. 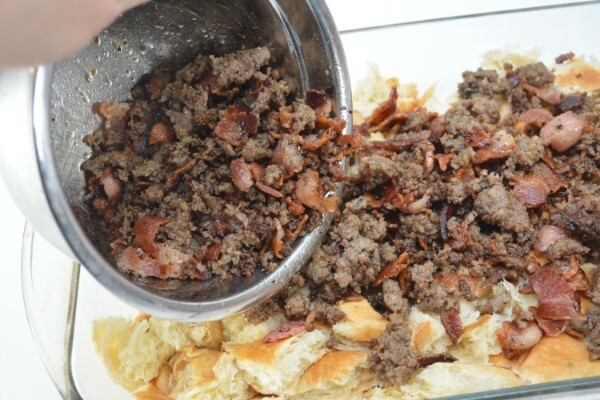 Sitting will give the croissant plenty of time to absorb the wet ingredients and the delicious flavor of the bacon and sausage. In the morning, preheat the oven to 350 degrees. Get the dish out of the refrigerator and remove the foil cover. 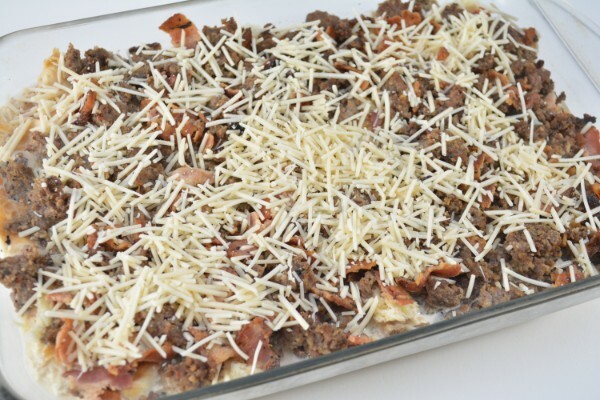 Sprinkle the casserole with parmesan cheese, then top with shredded cheddar cheese (I used white cheddar). 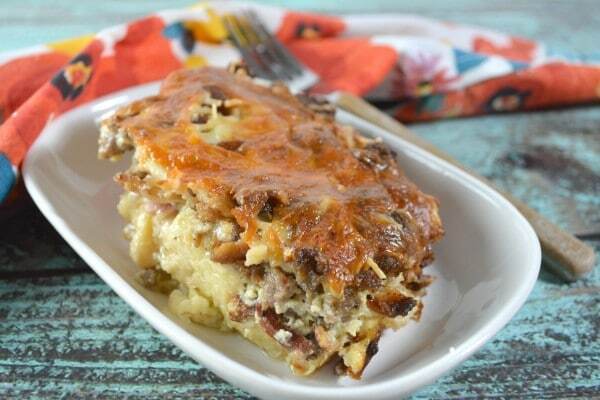 Your Overnight Croissant Breakfast Casserole is ready to serve! 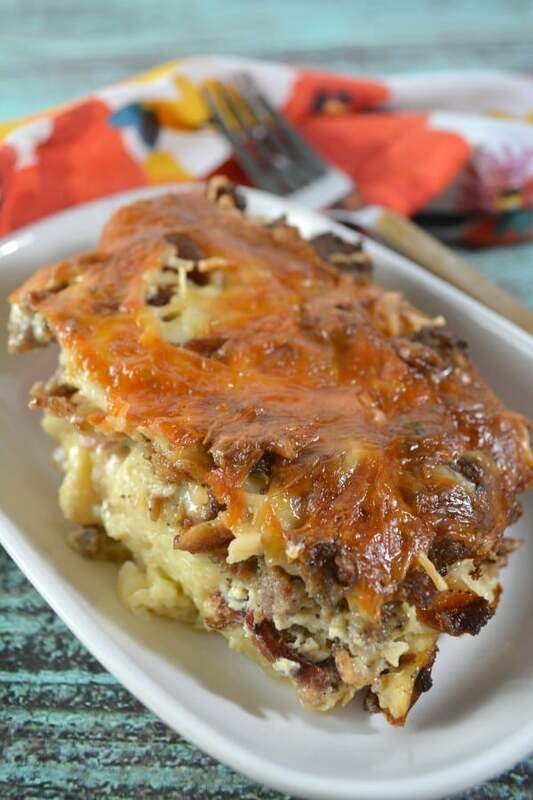 It should slice easily into squares/rectangles like lasagna. I’ve included the step-by-step photos above for my readers who like to know what the dish looks like throughout the prep process. Personally, I prefer to print out the recipe. 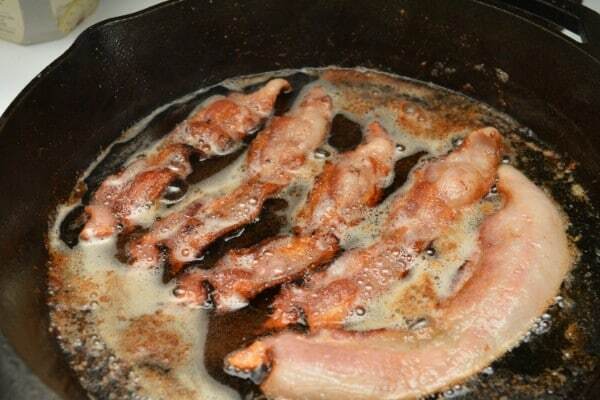 Cook 1 pound of bacon until it is crispy. Set it aside until it cools, then crumble it into pieces. Brown 1 pound of pork breakfast sausage over medium-high heat, drain fat. Add the crumbled bacon to the skillet. Tear croissants into bite-sized pieces and press them into the bottom of a greased 9x13 baking dish. Pour the meat mixture over the top of the croissants. 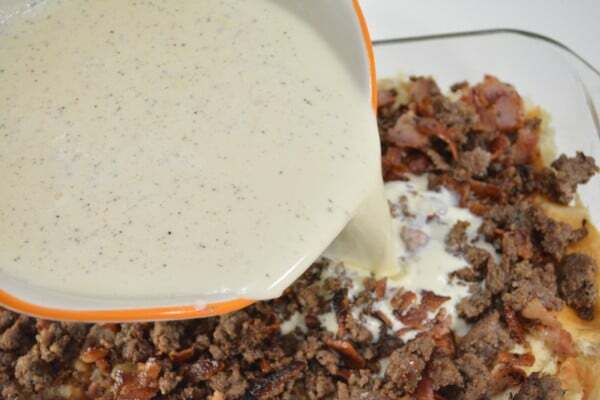 In a large mixing bowl, combine eggs, milk, and heavy cream. Add salt, pepper, garlic powder, mustard, and sage. Whisk to combine well. Pour the liquid mixture over top of the meat and croissants in the baking dish. Cover the dish with tin foil, and place it in the fridge to sit overnight. In the morning, preheat the oven to 350 degrees. 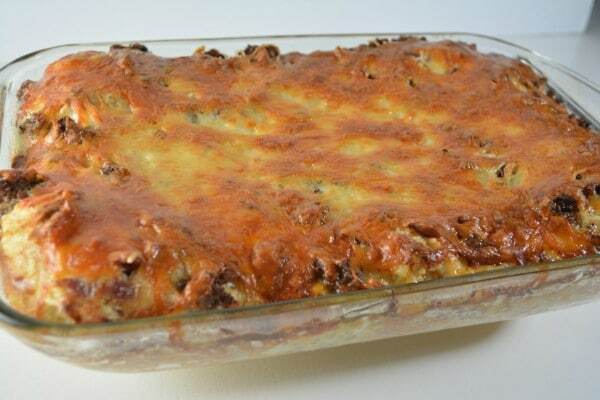 Uncover the casserole dish, and sprinkle 1 cup of parmesan cheese over the mixture. Top with shredded cheddar cheese. Bake for 45-55 minutes until it is cooked through and the liquid has been absorbed. If the top browns too quickly, cover with foil and continue cooking until the casserole is cooked through. 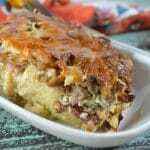 If you liked this Overnight Croissant Breakfast Casserole, you might enjoy some of my other breakfast casserole recipes. Want some veggies in your dish? 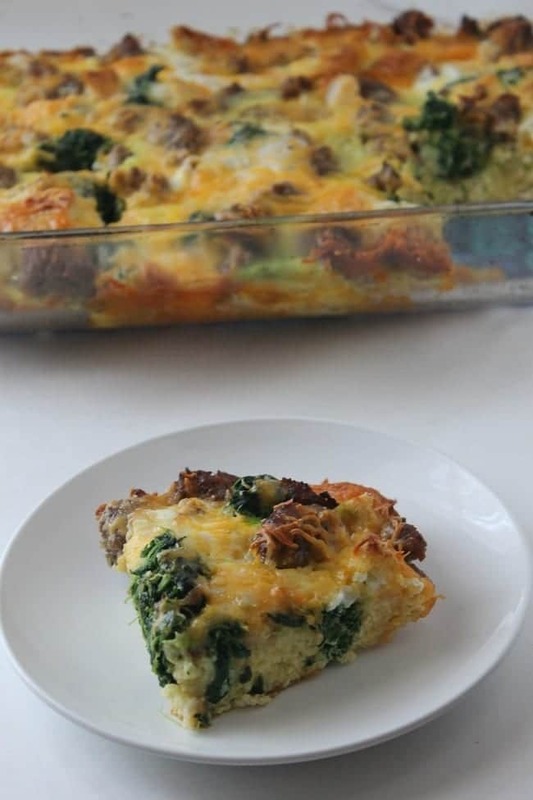 Try my Make Ahead Sausage and Spinach Strata. 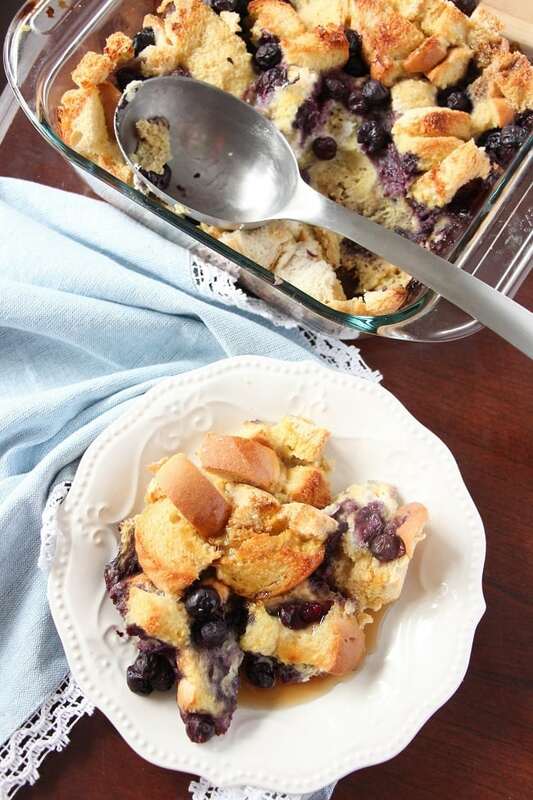 If you’re looking for something sweeter, you’ll love this Make Ahead Blueberry French Toast Casserole! I'm a work at home mom of five children. My passion is helping busy moms have happy, healthy homes and feel great about themselves. Get special offers and awesome freebies! Sign up for access to all my subscriber freebies plus special offers, ideas and tips delivered directly to your inbox.